These are just some additional examples of our prior works. 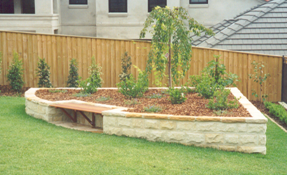 Garden bed constructed in a coursed random length pattern. 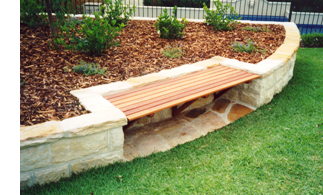 Seat set into the above garden bed. All screws and seat supports were recessed so as to not detract from the overall design. This is one of our favorite walls which was done to dress up a causeway. Pay particular attention to the arch over the drain entrance. 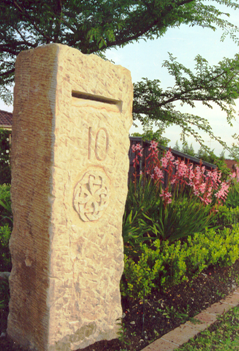 This Letterbox is carved from a single piece pf stone weighing approx 400kg and standing 5' tall. It was removed from an internal wall in a church at Balmain during a renovation. The Celtic knot and number were all carved on site. The rear of the letterbox has a solid wood door to ensure security of letters. The large recess is big enough to ensure all mail including magazines do not need to be bent.